Some of us want the best price we can get, some want luxury above all, and others would rather have something sporty to spice up their daily commutes. Fortunately, Volvo answers all of the above with its base Momentum, sporty R-Design, and ritzy Inscription trims, while still providing plenty of value, performance and luxury in each. 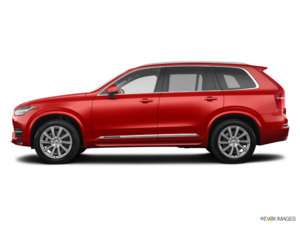 When Volvo first introduced its completely overhauled XC90 mid-size luxury SUV for the 2016 model year, I tested and reviewed a T6 AWD R-Design, which was such an improvement over its predecessor and so much more competitive against key rivals that it was easy to recommend. 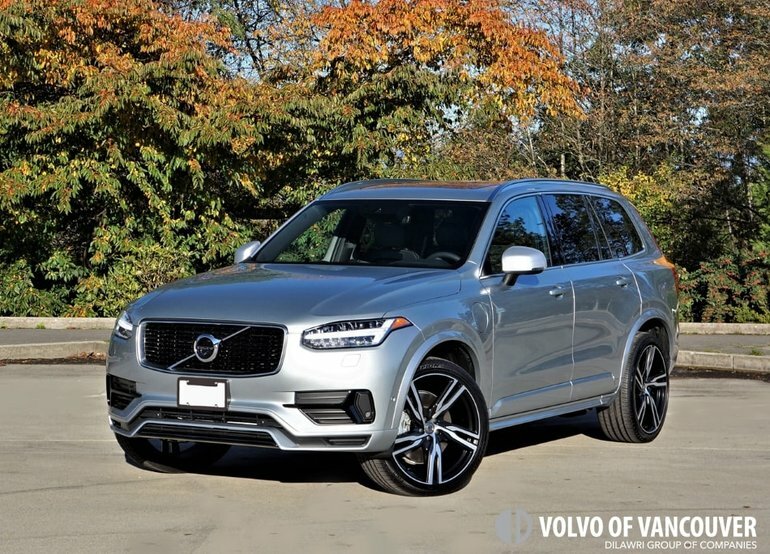 I followed this experience up with a 2017 XC90 T8 eAWD Inscription, which increased straight-line performance while replacing some of the R-Design's sporty detailing for a classier, richer look and feel. For 2018, I was once again given the chance to test the faster T8 eAWD powertrain, albeit in R-Design trim with a sportier wheel and tire upgrade, and I must say it was a match made in heaven. R-Design trim gives a sporting twist to the inherently elegant XC90, complete with a black mesh grille insert, less chrome and metallic trim, an edgier body-colour and glossy black lower front fascia, satin-silver mirror caps, machine-finish twinned five-spoke 20-inch alloy wheels with black painted pockets (that were upgraded to 22s on my tester), and a body-colour bumper filled with a unique gloss black diffuser-style grille. Together with the XC90's dramatically penned standard features that include Volvo trademark Thor's hammer LED headlights and an eye-grabbing set of vertical LED taillights, all set within a gracefully shaped body shell that's easy on the eyes no matter the angle, the XC90 R-Design is one compelling package. Along with its outwardly pleasing character the XC90 provides one of the more visually appealing and best-executed interiors in the mid-size luxury SUV class, this particular model finished in classic black with satin-silver and optional carbon-fibre detailing, the leather-covered dash, door uppers, armrests and seat upholstery featuring sporty white contrast stitching, the light coloured thread coming standard, but all the fanciful leather made available due to a $3,000 Leather package that also includes rear side sunshades. Those seats look absolutely stunning, and their standard 10-way adjustability, upgraded to special sport seats with power-extendable lower cushions and expanded side bolstering in the R-Design, made them even nicer on the back than they are to the eyes, with all around good inherent design and no shortage of calibration. Additional interior highlights include gorgeous perforated aluminum speaker grilles for the sensational sounding $3,250 1,400-watt 19-speaker Bowers & Wilkins audio upgrade, plus a jewel-like Orrefors crystal and polished metal shifter, because hey, we all need one of those. Of course, the XC90's finer detailing is more of want over need issue, the beautifully detailed diamond-pattern bright metal rotating start-stop knob making a luxury statement all on its own, although it's backed up by a cylindrical drive mode selector shod in the same dazzling full metal jacket. These last three items are totally unique details that separate Volvo from any other brand, giving its cabin an upscale ambience that wouldn't feel out of place to a Bentley or Rolls-Royce owner. Those personally familiar with such ultra-luxury brands might find that last statement laughable, but truth be told that's only because we're all conditioned to believe such highfalutin marques are better in every way then lesser nameplates, yet such is not always the case. The quality of leather, metal and composite workmanship around the XC90's cabin proves this point, with hard plastic difficult to find and the design, density, fitment, and damping of Volvo's switchgear second to none. Likewise, the 8.0-inch digital instrument display is mighty impressive for a standard primary gauge package, not to mention filled with useful functions like navigation directions, phone details, road sign info and more, but the standard 12.3-inch TFT gauge cluster in my R-Design is even more cutting-edge and gets all the same features plus four configurable graphics modes. Over on the centre stack, the XC90's vertically positioned 9.0-inch tablet-style Sensus touchscreen is better yet thanks to its multi-award-winning infotainment interface with an ultra-familiar tap, pinch and swipe gesture controls. Truly, it's best of the best when it comes to user-friendliness and overall functionality, while its standard feature set, including a backup camera, four-zone climate control, navigation, real-time traffic info, voice activation, Volvo On Call app (with remote start, vehicle tracking, and more), Apple CarPlay and Android Auto smartphone connectivity, audio/radio functions, car settings, etcetera, leaves nothing to the imagination. Another area of Volvo technology leadership is powertrains. Its singular engine approach is unique in the industry, and I must say quite brilliant. Rather than wasting resources on myriad engine configurations and displacements, the Swedish brand makes one direct-injection turbocharged 2.0-litre four-cylinder Drive-E engine and sources one eight-speed Geartronic automatic transmission before implementing this combination in a variety of ways throughout its entire lineup. A model's trim level doesn't denote the powertrain provided, although only the base Momentum is available with the least potent T5 AWD combination, good for 250 horsepower and 258 lb-ft of torque. Momentum, R-Design and Inscription trims can all be had with either T6 AWD or T8 eAWD drivetrains, both of which feature a turbocharger and a supercharger. This twin charging process allows for a maximum of 316 horsepower and 295 lb-ft of torque in the T6 AWD, and thanks to a complementary Twin Engine plug-in hybrid electric motor/battery combo, a monstrous 400 net horsepower and 472 net lb-ft of torque in the T8 eAWD. Monstrous probably isn't the right word to describe T8 eAWD performance, as it's the most progressively linear 400 horsepower and 472 lb-ft of torque you'll likely ever experience. I've enjoyed the T8 around town, on long high-speed freeway trips and most every other type of roadway in between, and have grown to appreciate its relentless forward thrust as much as its smooth, refined demeanour. To be clear, it's fast, but it's no Mercedes-AMG GLE 63 S or BMW X5 M beater, and it's not even trying to be. Instead, Volvo has its sights on the Mercedes-Benz GLE 550e 4Matic and BMW X5 xDrive40e, its mid-five second sprint to 100km/h coming milliseconds from matching the former and annihilating the latter by more than a second, while its claimed fuel economy rating is 10.1 L/100km in the city, 8.8 on the highway and 9.5 combined compared to 11.1 L/100km combined for the Mercedes and 9.9 combined for the BMW. Volvo's small-displacement four-cylinder, twin power and plug-in hybrid combination certainly pay off in performance and at the pump. Of course, all of the aforementioned SUVs were designed to drive on electric power only for about 30 kilometres before automatically starting up their respective internal combustion engines and continuing on as hybrids-the T8's battery was upsized this year for an estimated 30.5-km of range from its two electric motors. While 30 km doesn't sound like a lot, if your commute is short it's possible to get to and from work without using any gasoline at all, but Volvo more realistically estimates the result of regular charging (which takes about three hours from a 240-volt charger) will reward you with a Le/100km (gasoline litres equivalent per 100 kilometres) rating of 4.7 combined city/highway. That would make a welcome improvement to my fuel budget, considering pump prices for regular unleaded in Vancouver are now averaging above $1.50/litre after hitting record highs of $1.65 in May, let alone premium unleaded that shot up to $1.87 last month. Similar to the formidable yet linear power delivery, the XC90's ride and handling compromise are wonderfully agile without any harshness. Even with my tester's optional Pirelli Scorpion 275/35R22s it remained comfortably compliant no matter the road surface, yet pushed hard through a serpentine set of switchbacks it lived up to its European performance pedigree. Adapting to your mood and/or surrounding conditions, Volvo allows for adjustable steering and Drive-Mode settings, the former modulating between low, medium and high steering assistance, and the latter featuring Comfort, Eco, Dynamic (sport) or Off-Road modes. It's a quick and easy system to set up and makes a big difference to how the XC90 drives. Volvo backs up the XC90's confidence inspiring performance with a plentiful supply of advanced driver assistance systems, safety has always been core to the Swedish brand's ethos. It starts with auto on/off LED headlights with active cornering, forward collision warning with autonomous emergency braking (that even includes its own head-up display), lane departure warning with lane keeping assist, and rear parking sensors. My tester was upgraded with a $2,000 Vision package that adds blindspot monitoring with cross-traffic alert, one of the clearest, most helpful 360-degree surround-view parking monitors in the business, and power-folding auto-dimming side mirrors to go along with the standard auto-dimming rearview mirror inside, while a $2,200 Convenience package included front parking sensors, semi-autonomous Park Assist self-parking, semi-autonomous Pilot Assist self-driving with adaptive cruise control, a Homelink garage door opener and a few other handy items. Lastly, my loaner came with a $1,250 Climate package adding a heatable steering wheel, heated rear outboard seats, and heated wiper blades, making it perfectly suited up for winter ski trips with the entire family. Additionally, Volvo offers plenty of standalone options, such as a graphical head-up display, a dual-monitor 7.0-inch rear entertainment system, an integrated second-row booster seat, an active air suspension, and more. I'd be remiss not to jot down some key standard features too, with items not yet mentioned on the Momentum, which starts at $59,150 for the T5, $63,350 for the T6, and $74,950 for the T8, including fog lamps, proximity keyless access with pushbutton ignition and a hands-free powered tailgate, metal treadplates, aluminum interior inlays, rain-sensing wipers, satellite radio, a powered panoramic moonroof, a cooled glove box, rear climate controls, heatable powered front seats with four-way powered lumbar, driver's memory, mechanical releasing second-row seats, power-folding rear headrests, a semi-automatic load cover, a cargo opening metal scuff plate, active noise control (with engine enhancement), roof rails, and more. Features not yet mentioned on the R-Design, which starts at $67,900 for the T6 and $80,050 for the as-tested T8, include more sporty styling and trim modifications, a perforated leather steering wheel, exclusive steering wheel paddle shifters that really make a difference to driver engagement, metal pedals, a black roofliner, etcetera, while the Inscription, priced at $69,550 for the T6 and $81,650 for the T8, features a more luxurious exterior and interior design motif including genuine walnut inlays and standard perforated Nappa leather upholstery, plus ventilated front seats with power-adjustable side bolsters, front passenger seat memory, rear sunshades, and more. No matter the trim, it all comes in an interior that's extremely comfortable and very roomy. Even the third row was spacious enough for my medium-build five-foot-eight frame to fit in without feeling cramped, leaving about an inch ahead of my knees when the second-row was pushed as far rearward as possible. I had a couple of inches remaining over my head too, plus ample elbow room thanks to armrest cutouts. Volvo also provides pillar-mounted air vents for superb third-row ventilation, these identical to those found on the backside of the B-pillars for second-row passengers, while roof-mounted LED reading lights to benefit both rear rows. I wouldn't expect anyone to gripe about cargo capacity either, with 447 litres available aft of the rearmost seatbacks, 1,183 litres behind the second-row, and 2,427 litres when both rear rows are flattened. What's more, Volvo adds to XC90 versatility by dividing the second row into thirds in order to fit loads of long cargo like skis down the middle while the two outboard rear passengers enjoy the comfort of window seats (and those aforementioned rear heaters). Additionally, the load floor is almost totally flat when lowered, plus Volvo includes a convenient flip-up divider in the very back for stopping smaller items from shifting forward. It's tempting to go on and on describing the exceptionally good build quality of those seats, their folding mechanisms, the solid sound made when each door shuts, the beautiful finishing and fine materials used throughout, etcetera, etcetera, but I'd better leave it there in order to let you enjoy a few surprises for yourself. The XC90 is a superb luxury SUV that you should experience firsthand, after which I'm willing to bet you'll be hard pressed to leave behind when it comes time to go home.